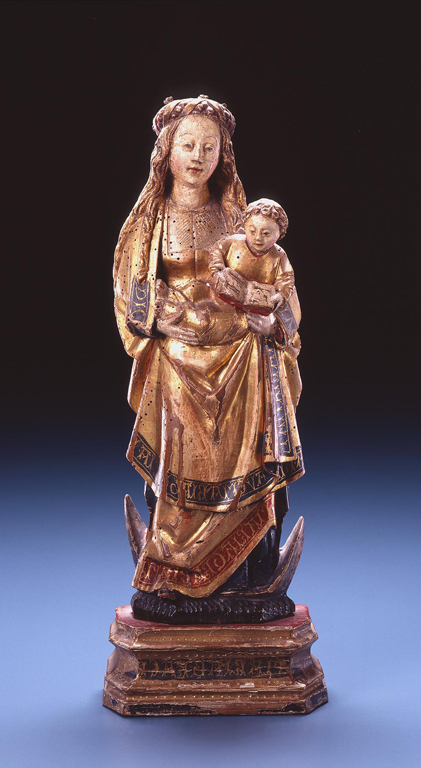 In the fifteenth and sixteenth centuries, Malines, Brabant (now Mechelen, Belgium), where this work was made, was an important center for the production of polychromed wood sculptures. The rosy-cheeked Virgin stands on a crescent moon that symbolizes her chastity and identifies her as the Virgin of the Immaculate Conception. Nestled in his Mother, the Christ Child presents an open book that denotes the word of God. Winters, Laurie et al., A Renaissance Treasury: The Flagg Collection of European Decorative Arts and Sculpture. New York: Hudson Hills Press, 1999, p. 116, cat. 54, color illus. p. 117. Bier, Senta Dietzel. Gallery of the Public Library of Winton-Salem and Forsyth County. Collectors' Opportunity. Winston-Salem, North Carolina" Gallery of the Public Library, 1963, p. 40. Collectors' Opportunity, Gallery of the Public Library of Winston-Salem and Forsyth County, 1963.